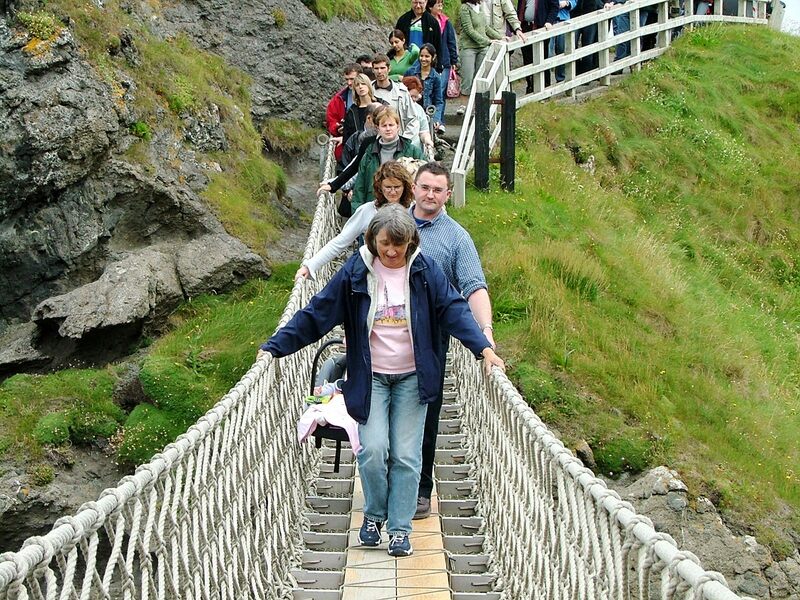 I can tell with certainty that every Carrick-A-Rede Rope bridge visitor has this picture. 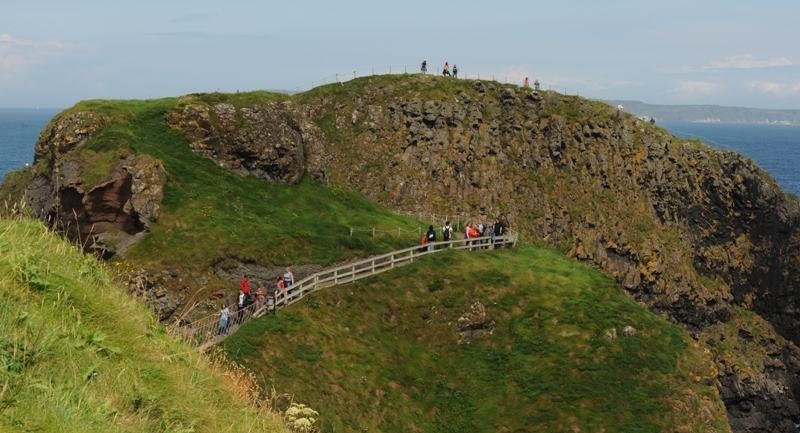 A one kilometre long coastal walk from the car park over the high cliffs is a treat itself, but still everybody hopes to catch a distant view of the famous bridge, so they stop after each turn of the path and take a snap. The truth is, you cannot see the bridge until you get there. 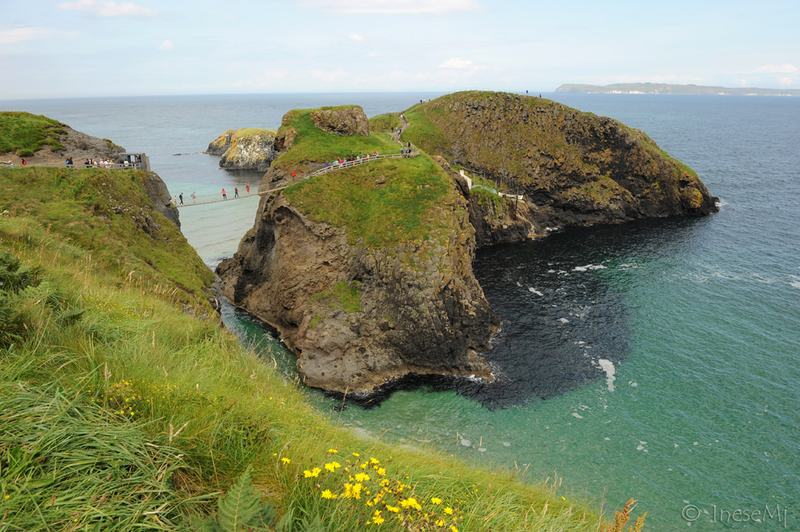 The Carrick-A-Rede Rope bridge is a famous tourist landmark of Northern Ireland. It connects the mainland with a small rocky island ( “carrick “goes for a “rock” in Gaelic ). If you expect an Indiana Jones-ish experience, you will be disappointed. The bridge is not too long; it won’t break up; it won’t swing and toss you in the waves. No one ever fell over the rope handrails, but there were plenty of tourists who just couldn’t make it back… No, they don’t get picked up by a helicopter as I hoped when I first crossed the bridge in 2005. The miserable are seated in a boat and ferried off to the mainland. No, I wasn’t in the boat. It was a windy day, but I made it back: a man with a little baby walking behind me gave me the courage. The rope bridge didn’t always look the way it looks now. Built by salmon fishers in 1600s it was used from June to September as an access to the rocky islands. The fishers ran their nets between the islands to catch the salmons coming through the area to spawn in the nearby rivers. Below is an image taken in the 19th century. Up to the 1970s the bridge had only a single handrail. 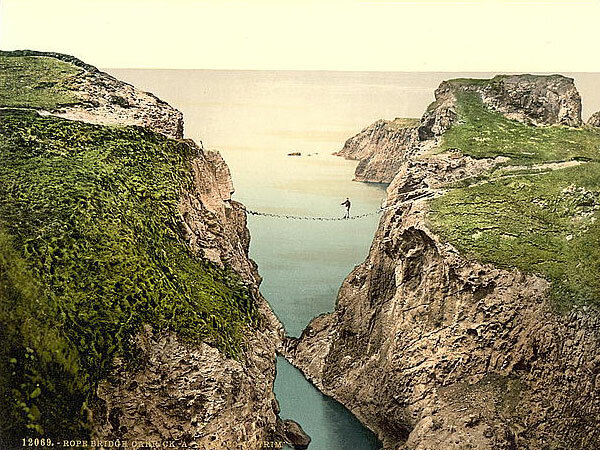 When the salmon fishing came to the end The National Trust installed a new, tourist friendly cage bridge to span the 18m wide and 24m deep chasm. It was a unique and costly project. The bridge was taken down and re-installed annually. Another one was built in 2004, and the current one is built in 2008. Now the bridge is opened all the year round if the weather conditions are not dangerous. 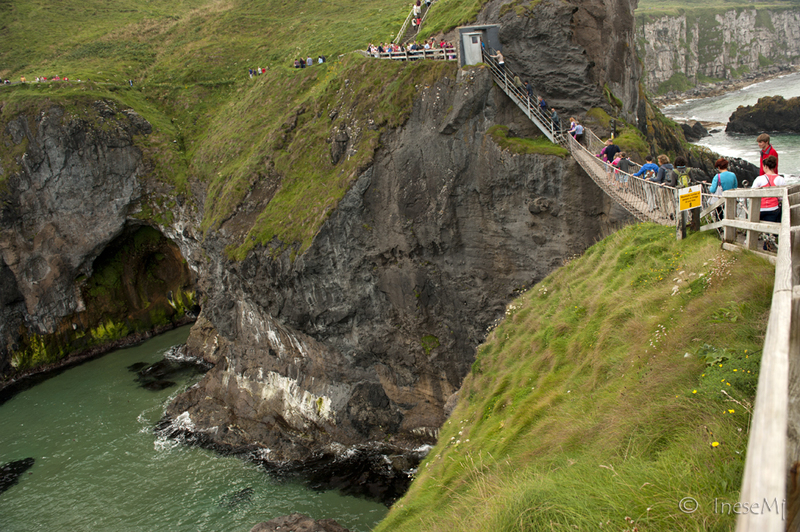 In June 2012 the Olympic Flame was carried onto the Carrick A Rede bridge by a P.E. teacher Clare Leahy from Coleraine. After that the Flame was carried to the Giant’s Causeway ( my next blog). Walking around the island you can enjoy the glorious scenery and take pictures. So this is my story for to day. There is a link to the webpage where you can read more about the timetable and tickets. If you don’t want to cross the bridge don’t buy any tickets and just walk over and watch the others cross. The walk is beautiful and free. Photography tip of the day: secure your shooting gear and memory cards. A gust of wind can ruin your trip. I enjoy reading about your adventures in Ireland. 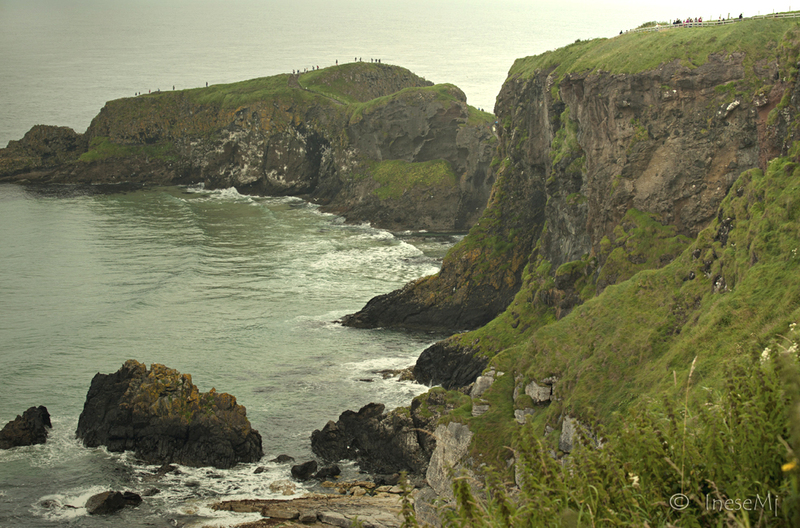 I visited the Carrick-a-Rede bridge in 2010, on the same day we did the Giant’s Causeway. Great memories! I used to live and work in another Carrick in Ireland, Carrick-on-Shannon, an amazingly beautiful place that you must visit! Thanks for posting this. A colleague at work just returned from Northern Ireland and was telling me about it but did not have any photos. Looks like great fun. Nice photos. Oh it is 🙂 The only hazard is our fear 😉 Thank you for reading! I now know that “carrick" means “rock” in Gaelic. Very neat! Thank you Andrea! I hope you enjoy the Giant’s causeway and the third post that is coming Tuesday – The Dark hedges 🙂 It was a very enjoyable day and I encourage everybody to visit the Northern Ireland. Whoa! That’s quite a bridge!! Thank you! 🙂 It is actually shorter than it looks like, but quite scary when swinging. Inese! That is terrifying! I don’t even like to cross suspension bridges in my CAR! Beautiful adventure photos and story though. I was giggling at the courage given to you by the man with a baby. Hehe great post. I really adore your photos! Such a fan of your writing too, and always look forward to the historical details. What an amazing place. Your photos are fabulous! Thank you! It felt so good to find everything unchanged. Respect to the Country. What fun! 🙂 I love bridges like that. Gorgeous scenes, Inese. Nice walk, too. When I retire, Your land will be high on my list. Oh wow. Yup, I’d love to visit Northern Island, and that’s the first thing I would do while I was there. Amazing images! Thank you! 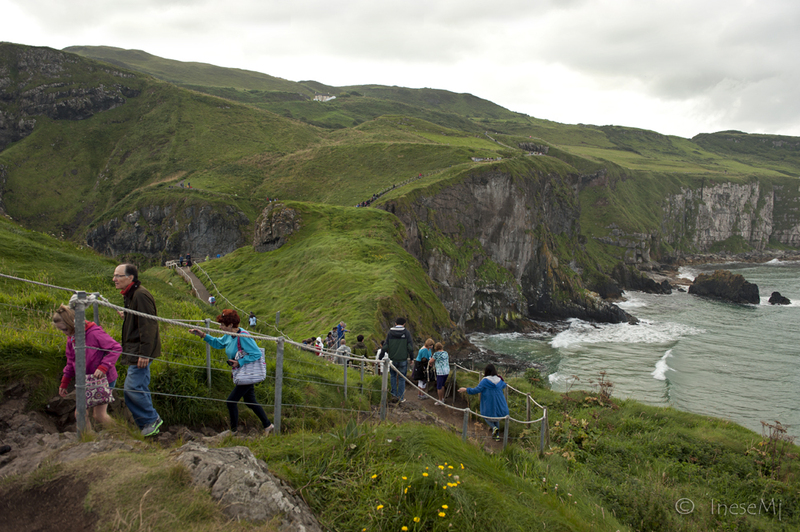 It is so beautiful there, all those cliffs, and lush grass, and air, and everything! Looking at your vivid photographs, I can almost feel the fresh air conforting the spirit of the wanderer, and the salty smell of the sea making him lucidly happy. Thanks, Inese, for so wonderful a present. It would scare the daylights out of me. It would just have to threaten to swing and I’d not set foot on it. You’re a braver woman than I am! My great-grandmother was from North Tipperary. She was a Guider. I ask everyone I meet from Tip if they know of any Guiders. They’ve all but disappeared. I live in South Tipp. I can ask around about the Guiders. You can never go back. My grandparents talked about it and my parents, but even just moving across the channel you create a different life. Even when you go back home almost every year it stops really being home when you bring up a family somewhere else. I get very nostalgic, and my eldest daughter goes to Ireland whenever she can, but it’s only ever to visit. Your roots remain, wherever the rest of the plant flowers. You are so right. It is good to know the roots, but to cut all the tree wouldn’t be wise. Some people I know did it, and it was all disappointment and stress. Too high the expectations. I met an Irish American when I was working in Paris who had ended up there after an unhappy episode in Ireland. He was a rabid supporter of the Provos and thought he’d go down like a house on fire back home. He obviously hadn’t heard that the Irish of the older generation at least don’t feel they have much in common with the Yanks, and certainly don’t appreciate them telling them how to run the country. He lasted a year and left. Oh that sounds familiar. People are picturing their past unchanged and expect to fit in just nicely with their new experiences, knowledge, money. The expectations are never met. Poor man, he just shortened his life with all the stress he got himself into. He was running away from a very unhappy divorce and children who didn’t want to see him. It came out in aggression—in his case directed against the British. He was just an anachronism, didn’t fit in anywhere. Anachronism, that’s the word. Who would leave all the life they have built? It is either someone with illusions, or someone making conflicts wherever they go. Wow! Exquisite scenery and an exciting adventure. That bridge is unbelievable!!! Thank you for stopping by Kate! For me the bridge is still a challenge 🙂 Especially when some excited teenagers start jumping and rocking it. 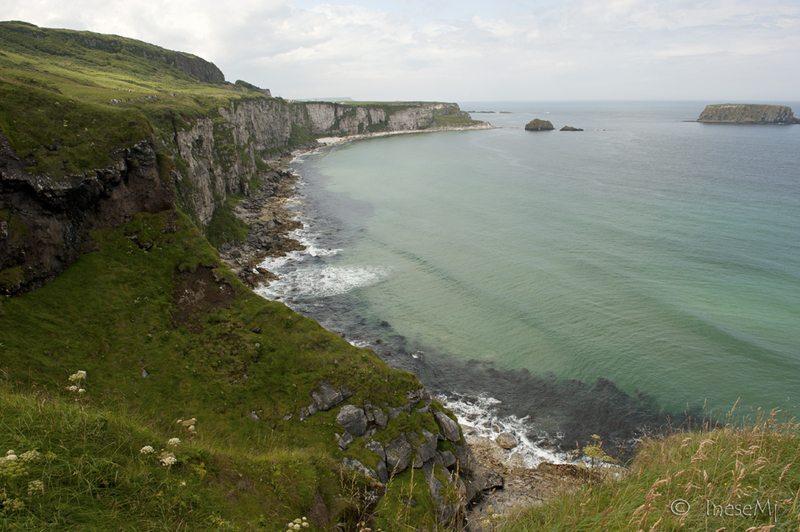 I wish everyone would have a chance to see the beauty of Northern Ireland. 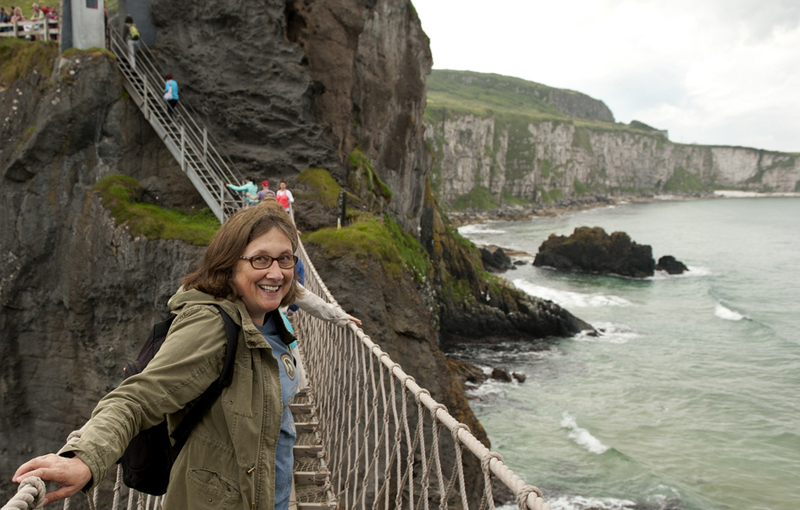 I have two more posts in process: Giant’s Causeway and Dark Hedges.